GAJSER AND JONASS WIN FIRST AT REDSAND. The third round of the 2018 MXGP Championship is off to a roaring start at Spain’s Redsand circuit. The first time MXGP host is providing excellent racing conditions thus far as the Qualifying races were full of action. 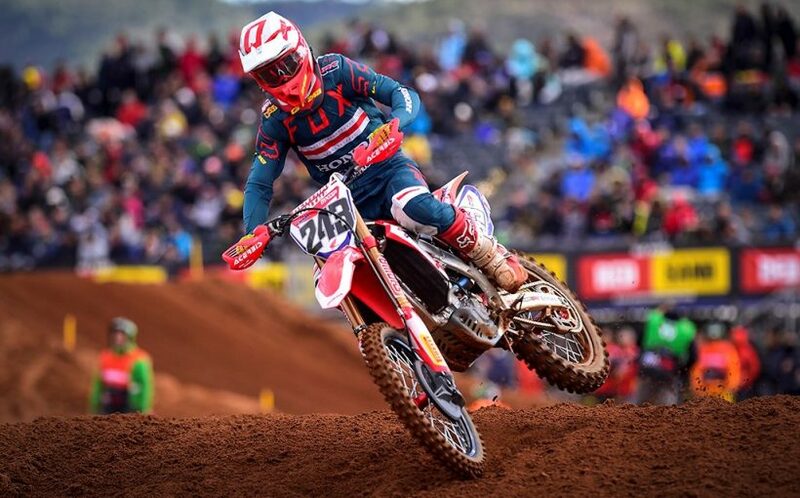 Team HRC’s Tim Gajser is back at the front of the MXGP field while Red Bull KTM Factory Racing’s Pauls Jonass remains the top contender in MX2 after they each won their respective qualifying races! On top of the MXGP and MX2 racing the first race of the 2018 EMX250 championship season took to Redsand along with the second round of EMX300 Presented by FMF Racing. In the opening 250cc race of the year REVO Husqvarna UK’s Mel Pocock took the race win over Tom Vialle and BUD Racing Monster Energy’s Pierre Goupillon in a competitive battle only 3 seconds separated the top three at the finish. In the first race of the second round of EMX300 presented by FMF Racing it was GL12 Racing’s Mike Kras who took the win after an early battle with Verde Substance KTM’s Brad Anderson as iFly JK Racing’s Manuel Iacopi and A1M Husqvarna’s Andre Lusbo took second and third. Team HRC’s Tim Gajser is no stranger to leading the MXGP field but recent injuries had held the Slovenian back until today. Gajser took the lead from the start grabbing the holeshot by holding the tighter line over Rockstar Energy Husqvarna Factory Racing’s Max Anstie. Joining Gajser at the front was another MXGP World Champion, Monster Energy Yamaha Factory Racing’s Romain Febvre. Febvre was in second immediately after the start and continued to apply the pressure on Gajser for the remaining 13 laps. Behind Gajser and Febvre was the #21 Rockstar Energy Husqvarna Factory Racing machine of Gautier Paulin. Paulin had a miraculous save on the opening laps of the race when he got his foot over the scrub jump. Luckily for the French rider he didn’t lose much time and was able to settle into third. The Red Bull KTM Factory Racing riders of Jeffrey Herlings and Antonio Cairoli both started outside of the top 5 and each had to come through riders throughout the race. One of the riders that proved toughest to pass was Wilvo Yamaha Official MXGP Team’s Jeremy Seewer. Herlings followed the Swiss MXGP rookie for 4 laps before finding a way past to take 4th. Seewer showed he had the speed to keep up with Herlings even closing back in on the #84 before missing his line and allowing Cairoli to squeeze by. Cairoli was then on a mission to pass Herlings and with 2 laps to go the Sicilian charged past his KTM teammate for 4th. At the finish Gajser was too tough for Febvre to pass as Paulin hung on for third with Cairoli and Herlings rounding out the top 5. With 4 former World Champions in the top 5 racing is expected to be even more intense tomorrow. Red Bull KTM Factory Racing’s Pauls Jonass is continuing in his winning ways this weekend. The Latvian again saw the toughest competition from his Spanish Red Bull KTM Factory Racing teammate Jorge Prado. Prado took the holeshot but was passed by Jonass before the first complete lap was registered. Fastest in both the Free and Time practice sessions was Bike IT DRT Kawasaki’s Darian Sanayei. Sanayei carried his speed into the qualifying race with a good start placing him just behind F&H Racing Team’s Adam Sterry during the opening laps. Sanayei passed quickly making his way to third ahead of Rockstar Energy Husqvarna Factory Racing’s Thomas Kjer Olsen. It was also a good qualifying race for Honda 114 Motorsport’s Hunter Lawrence as he finished in 5th only 4 tenths of a second behind Olsen. At the front Jonass tried to inch away but Prado wasn’t having it, keeping both Jonass and the fans on their toes. While Prado chased Jonass the #57 of Sanayei was right on the pair of KTM bikes in what was a 3 way battle for the win! At the finish line less than 1.2 seconds separated the top three and only 4 seconds separated the top 4. Kemea Yamaha Official MX Team’s Ben Watson took 6th 22 seconds off the pace of the top 4.